No one loves the vinyl revival more than us – well, perhaps other than Sainsbury’s, which is probably raking it in after recently becoming the biggest vinyl retailer on the high street. But the good ol’ record wasn’t brought back from the dead through discovery of a newfound convenience. An afternoon vinyl session still requires you to get up from your seat more than a 10-year-old who’s made the final round of musical chairs. And of course you have to be in the same room as your turntable to enjoy it. There’s no way round that – or is there? What if vinyl could be pocketable? No, we aren’t talking about a portable turntable of sorts – even the physical burden of a personal CD player would be sneered at nowadays – but how about one that can rip your records to digital files so you can carry them around in your pocket? Record-ripping turntables have been around for a while, but the Sony PS-HX500 can record up to DSD 5.6. Ergo, Sony calls it a ‘hi-res turntable’, so it’s not surprising that one of the first things we notice when lifting the Sony from its box is the hi-res audio logo sitting loud and proud on the plinth’s front-facing edge. While the ripping feature hardly seems necessary to keep the resurgence in full swing, it does mean that those buying their favourite LPs won’t also have to head to a download site to get it in glorious high-resolution for their smartphone or portable music player. So how does it work? Equipped with an internal analogue-to-digital converter and USB type-B output, the PS-HX500 simply hooks up to your laptop or computer’s USB input and, via Sony’s Mac- and Windows-friendly High Res Audio Recorder software, records the vinyl either as a WAV (up to 24-bit/192kHz) or DSD (5.6MHz) file. The process is simple enough too: just choose your desired format, hit ‘record’ when the vinyl starts playing, ‘stop’ when it’s finished and hey presto! You have a hi-res song. And of course, you can split recordings into individual tracks too. Invariably, some will jump at the chance to digitise their collection while others will be less bothered. If you belong to the second group, you’ll be interested to know that elsewhere the PS-HX500 behaves and looks very much like a typical turntable. On the design front, this turntable hasn’t followed in the fashionable footsteps of Sony’s colourful Walkmans, instead apeing the minimalist approach of rival decks around this price. The straight-edged, angle-cornered rectangular plinth is an understated, all-black affair that leaves nothing to the designer-in-you’s imagination. The plinth is largely unadorned, save for a dial tucked in the bottom left-hand corner where you can switch speed from 33 1/3rpm to 45rpm, and the low-sitting platter adds to that simplistic aesthetic. While we prefer the more substantial, towering construction of the Audio Technica AT-LP5 (£330), the quality of Sony’s slender, vertically challenged build is fine. It means you have to bend down a little further to put on a record than you do with the Audio Technica, but the four feet, which are fixed to the plinth, can be screwed to raise the overall height. 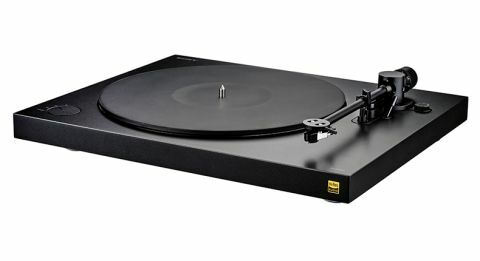 Assembling a turntable can be finicky business, but all the Sony asks of you is to plonk (with care) the die-cast aluminium platter and 5mm-thick rubber mat onto the 30mm-thick MDF plinth, hook up the belt drive, and balance the tonearm using the counter and anti-skating weights. Sony is shouting about its new one-piece tonearm with an integrated head shell, claiming that by locating the stylus point in the centre of its axis and limiting rotational movement it can produce a more precise, stable trace. To save you flicking through the supplied literature, the recommended tracking weight for the Sony’s moving-magnet cartridge is 3g, although we recommend any newcomers to turntables take guidance from the manual, which is thankfully as intuitive as instructions for the average piece of flat-pack furniture are complex. Of course, there’s little advantage in ripping your vinyl to hi-res – or even playing it straight off the deck – if the PS-HX500’s sound quality is poor. But we aren’t about to rain on its so far promising parade. In fact, we are full of compliments for the Sony deck. We settle Dire Straits’ Brothers In Arms down on the spindle and there’s no mistaking the Sony’s penchant for detail as the synthesized pan flute and African-influenced drums in Ride Across the River come through with clarity and texture. It’s articulate with the track’s offbeat rhythmic pattern, tying the multiple strands together for a coherent and layered delivery, and has the dynamic dexterity to bring fairly tenuous sonic shifts to our attention. The sprightly Sony is quick off the bench too, springing into action with the upbeat opening of One World. It thrusts the drumbeat forward and, with a real sense of gusto and agility, puts its foot through the melodic guitar riffs that cut through the track. It’s with the more sanguine tunes that the PS-HX500’s slight tonal inclination to the light side of neutral reveals itself, the presentation favouring a crisp consistency over the full-bodied solidity of some of its rivals. It’s not something to penalise the Sony for, but is noticeable when listening to it next to the Audio Technica AT-LP5, and perhaps something to bear in mind when it comes to system pairing. Elsewhere, the Sony’s big, open sound lends itself to the lamenting guitar lines and aching organs in the album’s eponymous finale too, and there’s the space and insight to keep a hand on both as they weave around each other. There’s a delicate naturalness to Knopfler’s pensive vocals too, which are confidently presented in the soundstage and demonstrate the Sony’s pleasing midrange insight. Furthermore, the sundry piano notes in Miles Davis’s So What and the trumpet-playing that wheels over the top, are both engaging, informative and staged with convincing stereo imaging. We feel confident bestowing praise on the treble too; the intricate cymbal-brushing that fills the right-hand channel is clear and subtle, the Sony balancing detail with refinement admirably. As expected, big gains in clarity and detail are made when we switch to our reference Cyrus Phono Signature phono stage (£1200); vocals are fleshed out and instruments are subtler and more sure-footed. Within its own price-bracket, though, the Sony’s own is very capable indeed. And, if you plan to use it, the phono stage would pair well with a quality midrange amp such as the Cambridge CXA60 (£500) and a pair of speakers such as the Dynaudio Emit 10s (£500). Anything that keeps vinyl fresh and appealing is gold in our eyes, and the PS-HX500 is a good example of that. It's a best-of-both turntable that caters for record spinning and hi-res ripping, and to anyone torn between their affection for the nostalgia and tangibility of vinyl, and the convenience and practicality of digital. As always, performance is king, though, and in this instance that only furthers the Sony’s likeability; while it’s not the classiest-looking turntable on the market, it has all the class in the sound suite instead. A very good buy.